Alexa Joy Milliam beat Sakaya Ishii, 6-2, 7-5, while Alexandra Eala prevailed over Mio Mushika, 6-0, 6-3 in the championship round played at the National Tennis Center in Kuala Lumpur. The Philippines won over South Korea, 2-1, while Japan defeated China, 2-1, to arrange a title showdown. "We didn't really know what to expect in our finals game versus Japan but the girls played incredible. And according to Milliam, she is playing the best tennis of her life this week," said coach Czarina Mae Arevalo, who has represented the Philippines in the Southeast Asian Games, Asian Games and Fed Cup. "We were lucky the Japanese felt the pressure so they didn't start that strong. 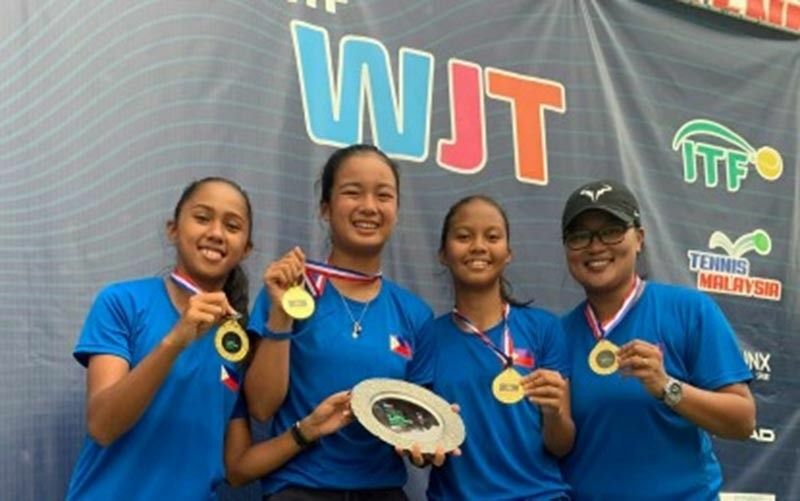 Our girls took the opportunity to lead all throughout the match," added Arevalo, who also served as coach of the girls’ team in the Asian 16 and Under Touring squad, which is supported by the International Tennis Federation and the Grand Slam Development Fund. In the battle for third place, China won over South Korea, 2-0. Hou Yanan defeated Jang Gio, 6-4, 6-3, while Sun Liang outplayed Kim Yu-jin, 6-4, 6-3. Chinese Taipei outplayed Hong Kong, 2-1, to settle for fifth place. Lin Fang An scored a 6-2, 3-6, 11-9 victory over Li Man Wai Chloris in the first singles but Hong Kong's Tang Lok Shu beat Huang Chin Ting, 6-3, 6-4, in the second singles. Huang and Lin downed Erica Kanna Hagi and Lok Shu Tang, 4-6, 6-1, 10-7 in the deciding doubles match. Australia trounced New Zealand, 2-1, to finish seventh. New Zealand took a 1-0 lead when Sasha Situe won her match over Hana Sonton, 6-3, 6-1. However, Australia won the second singles behind Jessie Culley's 6-4, 6-1 victory over Renee Zhang while Culley teamed up with Taylah Preston to beat Situe and Zhang, 6-2, 6-4.